I have done a few preview posts while waiting for the release of the big movies like Star Wars: The Force Awakens and Batman v Superman: Dawn of Justice. Now, I would like to discuss my expectations and predictions for the new Marvel movie – Avengers 2.5 also known by its actual name Captain America: Civil War. In preparation for the film, I have rewatched both of the Captain America’s films and enjoyed them even more than the first time. If you would like to read my review of the previous two films, you can click here – that post is one of my early ones and the reviewing style is completely different from the way I review films now, so don’t be too harsh. In addition, not only did I rewatch the previous movies in the series, but I have also actually read the graphic novel by Mark Millar and Steve McNiven (the main series of the 7 issues) that this movie is at least partially adapting. 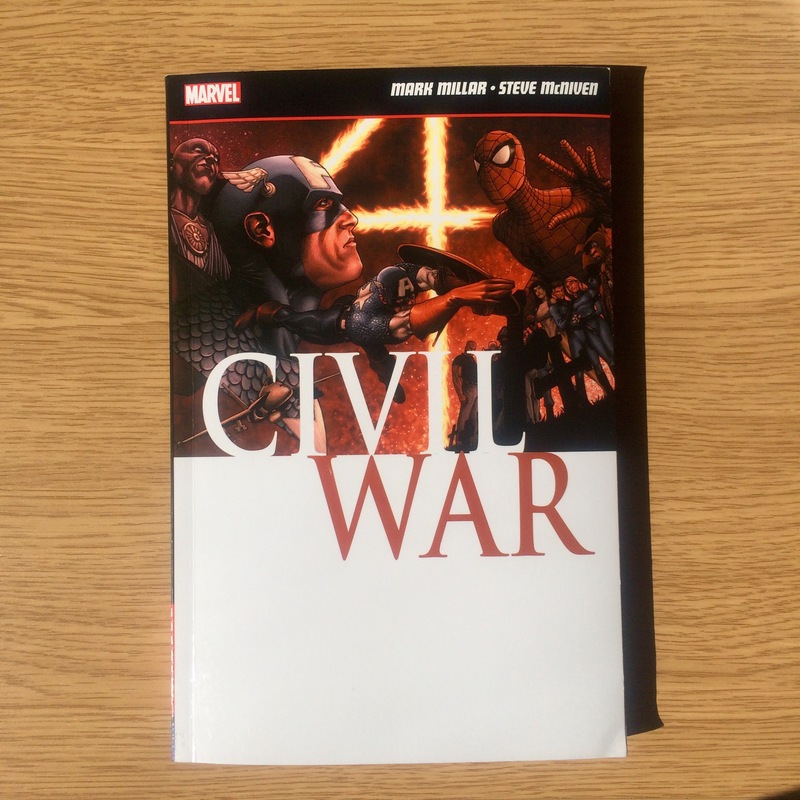 Civil War graphic novel is one of the first serious superhero graphic novels that I’ve ever read. As a child, I would read comic books about magic that were aimed at very young audiences. Nowadays, the majority of graphic works that I used pick up would be quite biographical, like Maus and Persepolis. However, Civil War really made me want to get into comics more. I have always felt kinda overwhelmed with the lore of the comic book universes and didn’t really know where to start. But, through Civil War, I discovered that there is a bunch of limited series style graphic novels that are easily accessible to new readers. You don’t have to hunt down different issues, but can enjoy the whole story all at one, in a book format! Because of this, I have recently purchased the Greatest Batman Stories compilation novel and I’m also actively looking for the Watchmen graphic novel in my town’s 2nd hand shops. So, let’s talk what the film might and will change when transferring the Civil War story from the page to the civil screen. SPOILERS for the comic book and possible SPOILERS for the movie. To begin with, from the trailers and previous MCU films, we know that the incident that will divide the superheroes won’t be an unsuccessful TV show and will have nothing to do with New Warriors. Instead, The Avengers will disagree over the Winter Soldier question, thus, making it a personal matter to Cap. In addition, the aftermath of Sokovia and other accidents, that The Avengers were involved in, like Battle of New York will only deepen and widen the rift . In addition, the film will probably cut a lot of characters that were involved in the original story. For one, Marvel Studios does not have the rights to X-Men and Fantastic Four characters – it is a miracle that they got Spider-Man. Moreover, MCU has a lot of characters already, without adding a bunch of new ones ( that’s why I called the film – Avengers 2.5 – it is more of a team up movie rather than a solo standalone feature). So, if Cap 3 introduced a big group of characters all at once, the majority of them would lack the necessary development and would overcrowd the film. In the comics, it is a different story – all of the characters, that were involved in the Civil War story, have about 50 years of history behind them – they are known to the avid comic book readers, while the movie has to cater the needs of the mainstream audiences, who do not know anything about these characters. Having said that, while the film won’t add a bunch of new characters, we will be introduced to a few of them. Black Panther and the new Spider-Man (with the best suit ever – the CGI eyes are amazing) will make their debut. I do not really think that they will reveal Spider-Man’s identity like they did in a comic book Civil War, since Spidey is so new in the MCU. I feel like they will save this big reveal for a solo Spider-Man film, maybe even the last film of the new trilogy. On the other hand, Black Panther’s comic book storyline probably won’t be changed that much, but the movie might add something more to it. In the comic book, X-Men characters were sorta neutral, so the lack of them in the film won’t be a huge loss. On the other hand, Fantastic Four’s characters played a big role in the events, so I wonder who will replace them in the movie’s version. Doctor Strange was also neutral in the comics and since he technically is still Stephen Strange – the surgeon in the MCU (he will get his powers in his own film), we will probably only get a post-credits scene with him. Other characters, like Thor’s Cyborg Clone will either be cut or substituted. There is only a small chance that any Thor lookalikes will appear in the film, as Chris Hemsworth is not listed on IMDb. Nevertheless, that plotline might be included in the film by replacing Thor’s Clone with Vision. The characters or team like Goliath, Mrs. Sharpe, The Thunderbolts (Marvel’s Suicide Squad), Young Avengers and Namor will probably also be cut. I also don’t think that TV characters, like Daredevil and The Punisher, will appear. I wonder whether the film will keep the idea that Nick Fury is on Captain America’s side, while the rest of S.H.I.E.L.D. is supporting Iron Man. Either way, Civil War film will definitely mark the end of The Avengers as we know them now. I am mostly sure that, in the movie the same way as in the comic book, both teams will have members, who will question their choice and will change sides. We will probably get ‘mole inside the team’ plotline as well. The negative zone prison and the fifty state project will probably be too comic-book-y and too grand ideas for the film, so the actual Prison 42 will most likely be different – more realistic maybe? In general, the film’s Civil War will probably be a much smaller scale event. I am also interested to see whether the film will keep the ending of the comic book. Will Tony become the S.H.I.E.L.D director? Will Cap surrender? What will be Winter Soldier’s role? I also heard the rumors that they might include the death of Captain America storyline at the end of Civil War – really don’t want that to happen. It would also make Civil War very similar to BvS, and I don’t think that’s a good idea. So, in conclusion, I have a lot of questions and possible speculations about the film and that’s all part of the fun with these comic book movies. I loved the graphic novel Civil War and can’t wait to read more – now I feel stupid for waiting so long to star reading the comic books. Civil War film will be directed by the Russo brothers. Since half of their filmography consists of past and future Marvel movies (they will direct Avengers: Infinity War Part 1 and 2), I don’t really have anything more to say about their previous work. I will briefly touch upon actors’ previous work in the actual review of the film, although I will probably be repeating myself a lot since I have said almost everything I wanted to say about them in my past Marvel movie reviews: Avengers Age of Ultron, Ant-Man and Guardian of the Galaxy. If you want to read my either comic book movie posts, both Marvel and DC, you can find them here: Marvel Phase 3, X-Men, Fantastic Four, Deadpool and BvS. 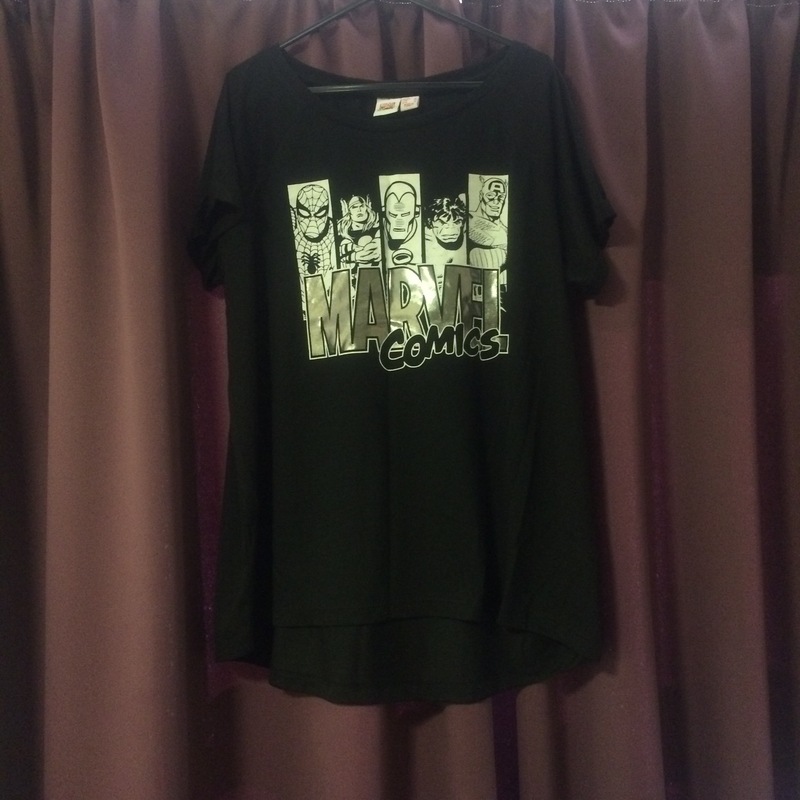 I am planning to see the film on April 29th, in the morning, and I will definitely be rocking my Marvel Comics T-Shirt. Will you be cosplaying for the premiere and what are your predictions for the film? Let’s discuss this in the comments! Think I read that Fury won’t be in the movie at all, I think that evil lair coming out of the ocean will be the prison and it would be a ballsy move to kill Cap.